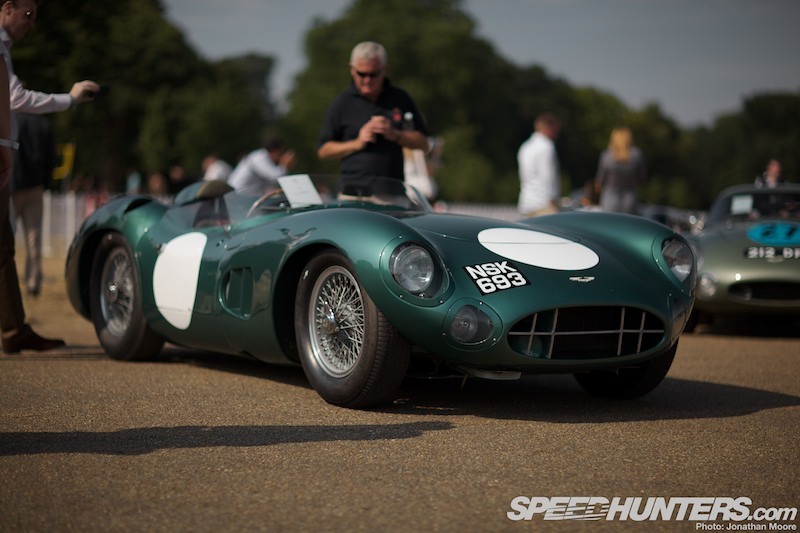 Seeing one Aston Martin on the streets of London isn’t a major thing, it’s true. Even catching sight of a couple in a day wouldn’t lead to much comment. But seeing dozens at a time gliding around the streets of Kensington brought West London to a virtual standstill. 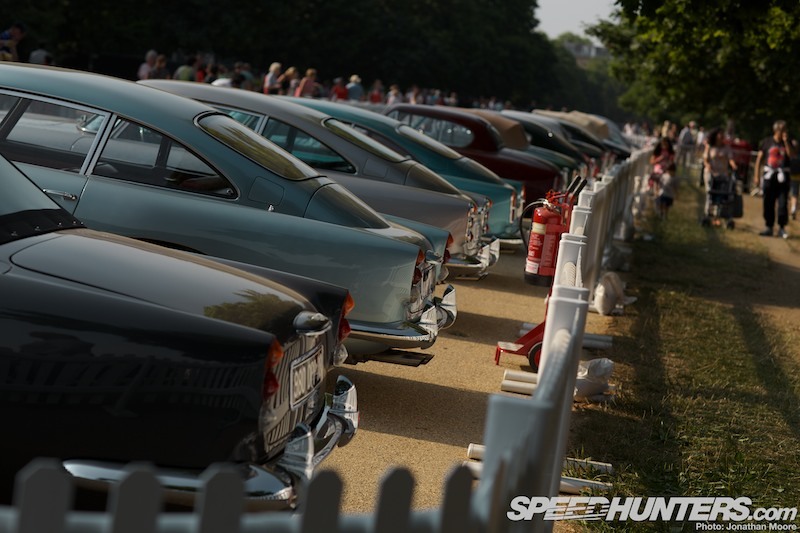 And that was even before getting a glimpse of over 200 more lined up in one of London’s Royal Parks, from the oldest to the newest model, both street-wise and race-bred. 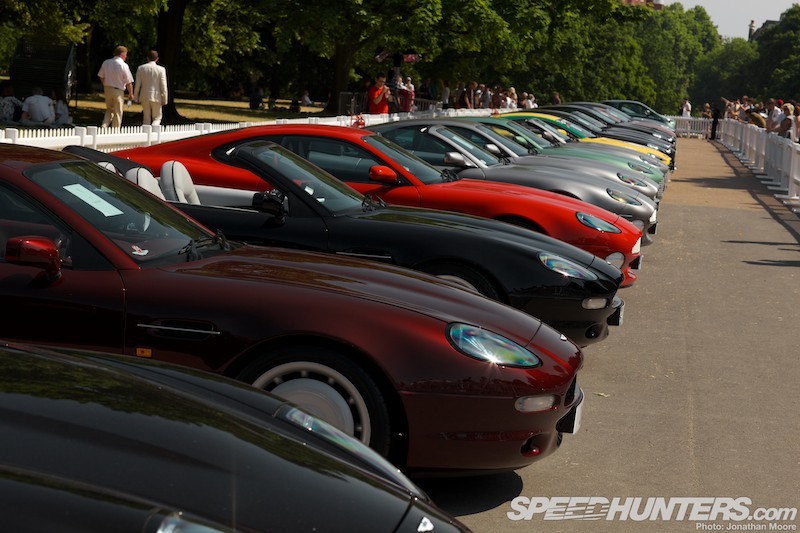 This amazing gathering in Kensington Gardens, west of Hyde Park, was the centrepiece of Aston Martin’s centenary celebration week – an event that the company had been building towards throughout 2013. 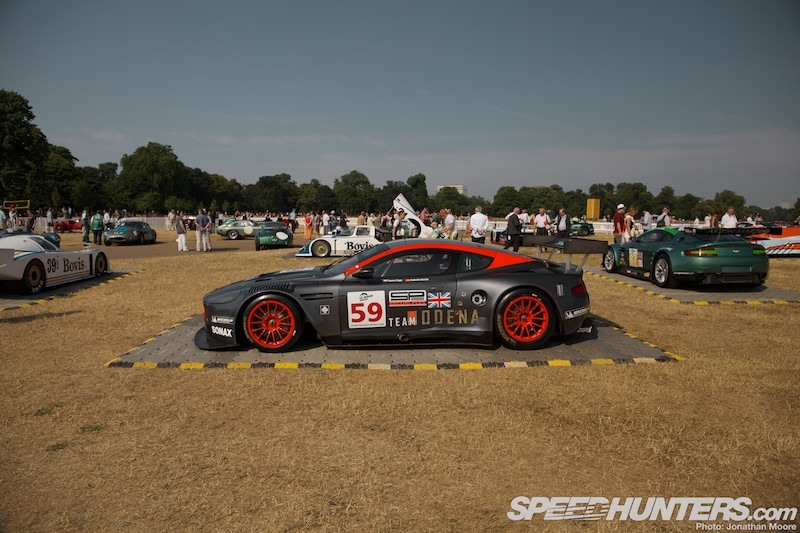 Following a spectacular kick-off in Dubai back in January, Aston’s celebrations have taken in the Nürburgring and Le Mans 24 Hours, the Villa D’Este concours, the AMOC race weekend at Brands Hatch and the Goodwood Festival Of Speed. 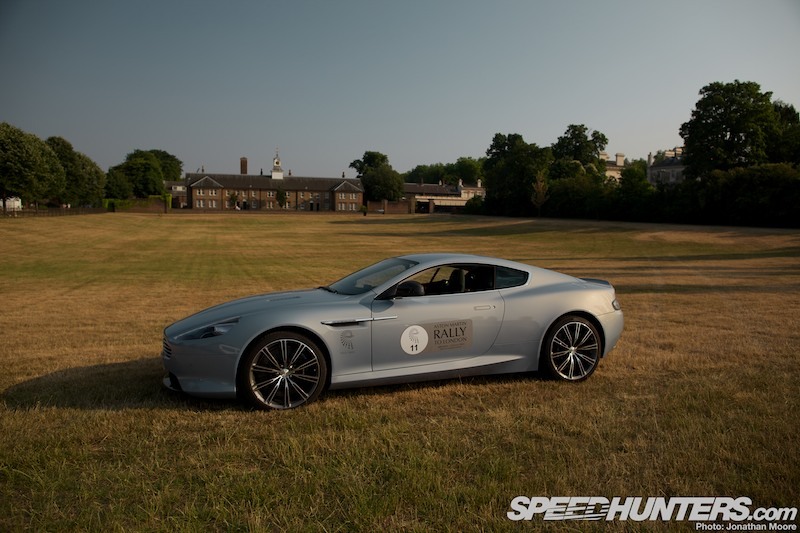 London is inherently linked with Aston Martin: the business was started by Lionel Martin and Robert Bamford in understated premises just off the Fulham Road back in 1913. 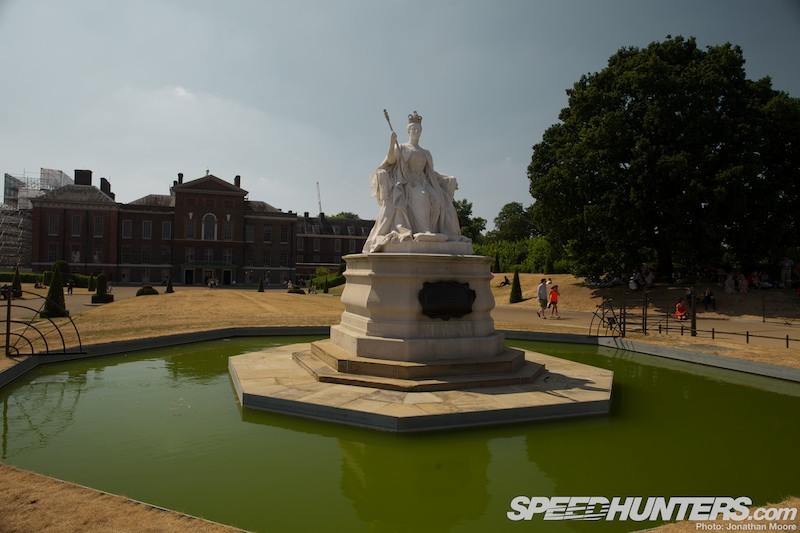 The opulent surroundings of Kensington Palace might have been just half a mile away in distance from Aston Martin’s first workshop, but it was a world away from the company’s humble beginnings. 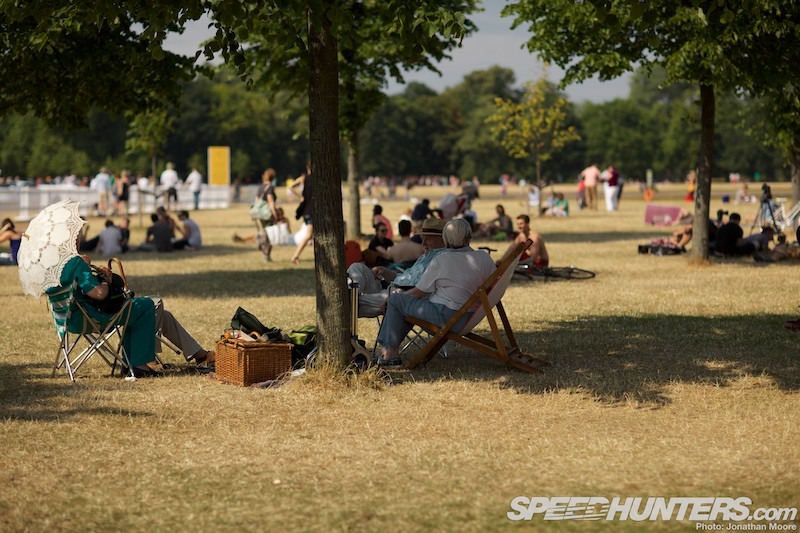 The gathering had a surprisingly understated atmosphere about it: the Royal Parks are always busy in any case, and with the sun beaming down it seemed like the whole of London was out enjoying the weather. The Celebration hadn’t been given major publicity, mainly because of the location, but it was still funny to hear so many people on phones, disbelievingly telling their friends about what was laid out before them and telling them to get down as soon as possible! 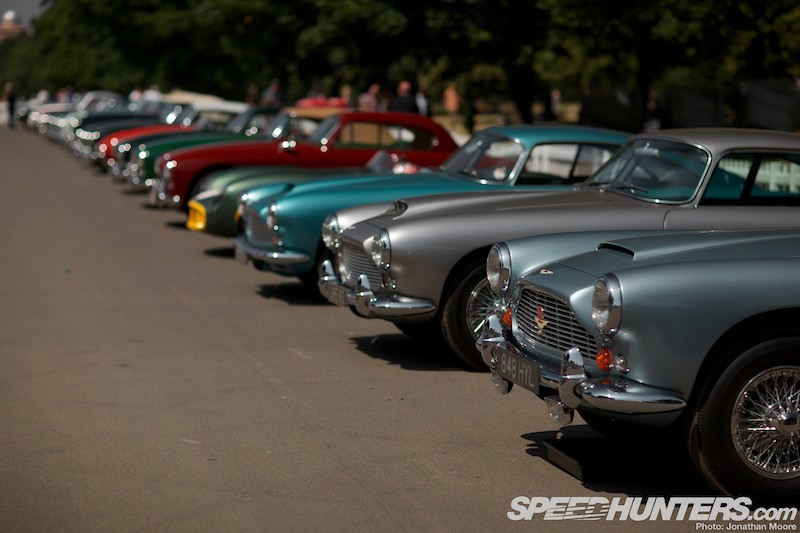 So it turned out that a lot of those who had come out just to soak up the sun instead found themselves dazzled by a different kind of attraction: the classic lines of these hundreds of Aston Martins – the largest single gathering of AMs in history. Even though I’d seen the list of what was expected, I still hadn’t taken in the breadth of what would be on show. I’d been privileged to ride on board the 100-car parade around the Nürburgring, seen the same from the fences at Le Mans and enjoyed the racing at Brands Hatch, but this was in a different league. 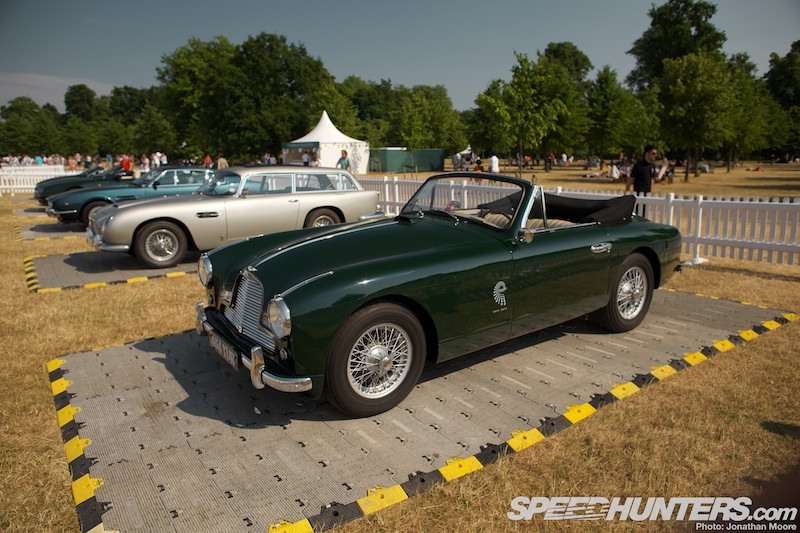 The majority of cars were privately owned, and 100 of the models present – old and new alike – had just completed a stunning rally across Europe. The trip had started at Lake Como in Italy, crossing the Swiss Alps into Germany to the Nürburgring and then turning east to travel via Spa before heading to London. 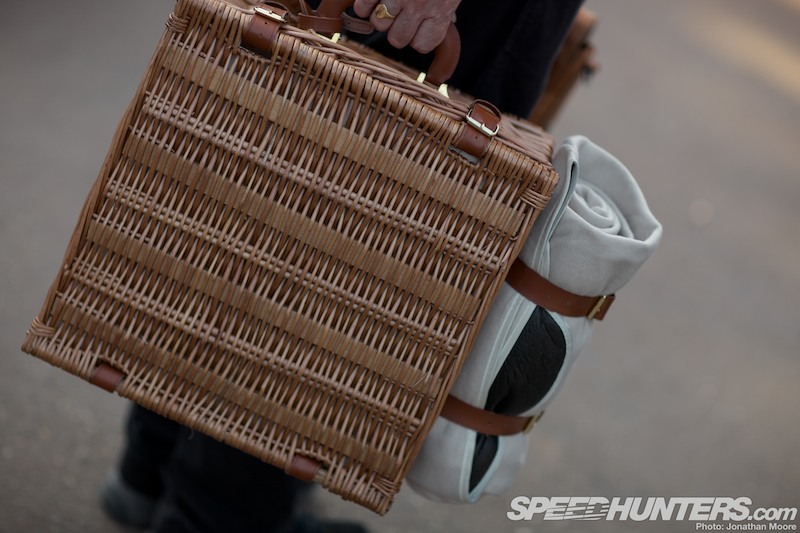 The 100 owners were then parking up and partaking in a very agreeable Picnic In The Park, complete with bespoke Aston Martin hampers. 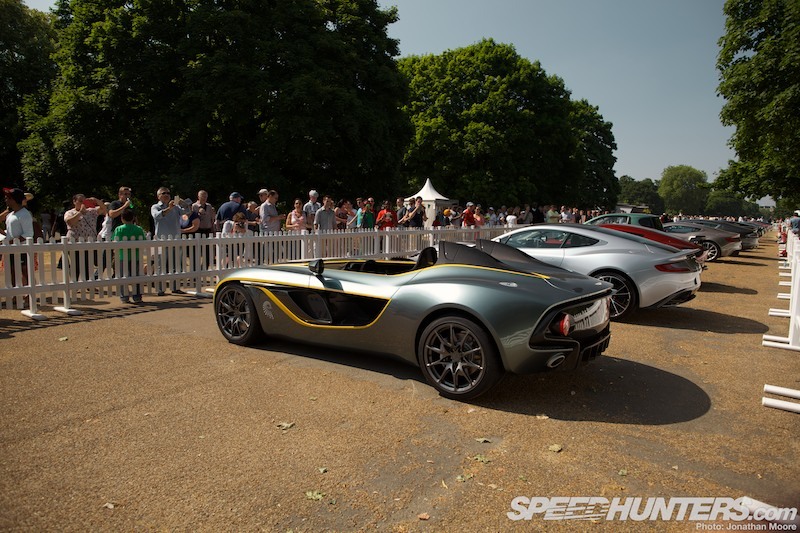 Kensington Gardens was turned into a very classy Aston Martin garden party for the day, with appropriately-named refreshment stops such as the Lionel Martin Bar dotted around, and more than one opportunity to take in a glass of bubbly whilst appreciating the huge collection of cars. 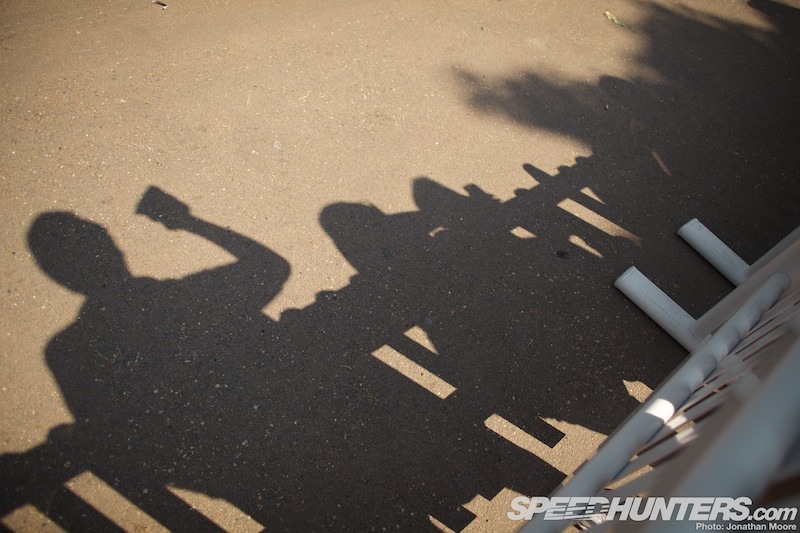 But most eyes and cameras were trained on the simply stunning timeline that took up several hundred metres of the main boardwalk that bisects the gardens, and people thronged against the fences all day. It’s worth just thinking about the enormity of that for a minute. 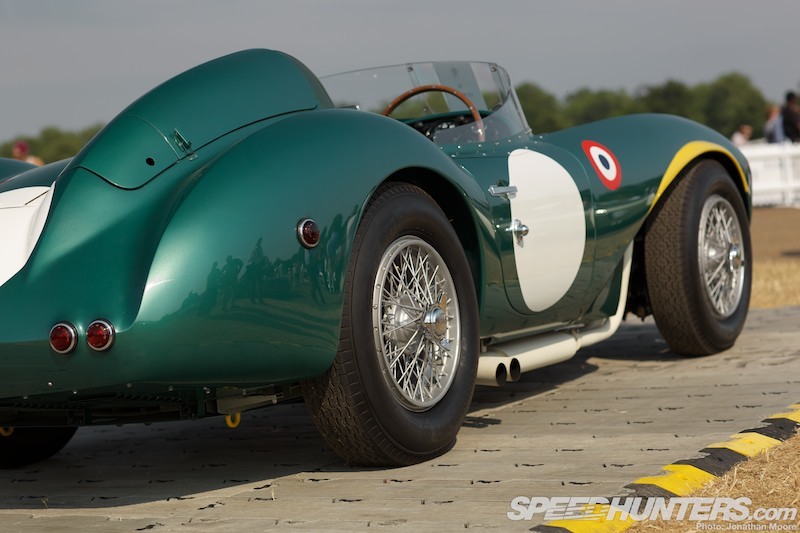 We’ll be delving more deeply into Aston Martin’s interesting and often turbulent century-long history next month for a dedicated theme, but this living display of their past, present and future was utterly overwhelming. 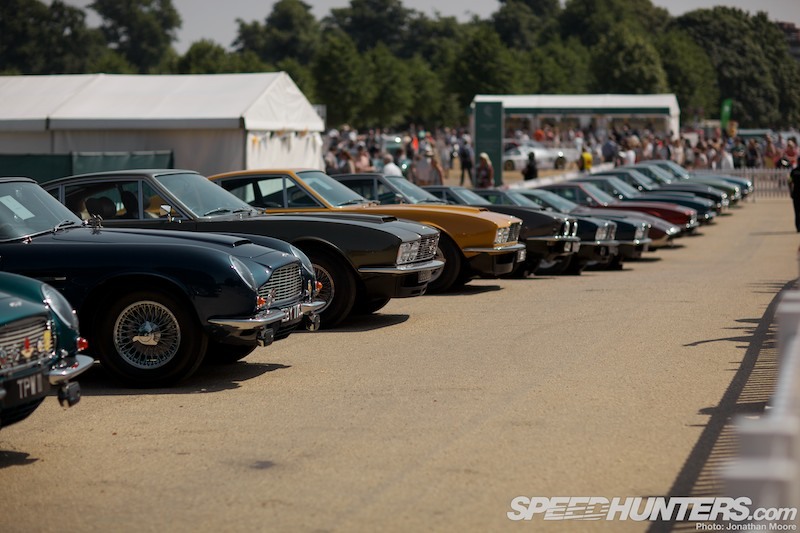 …this was an opportunity to enjoy Aston Martin through the years from every angle. 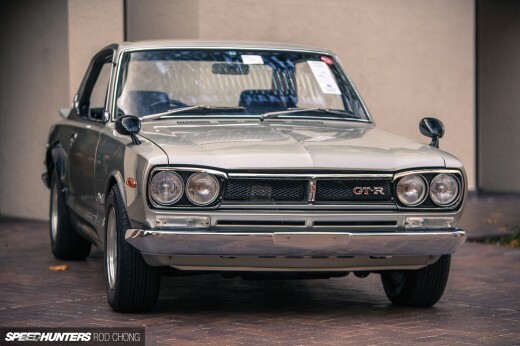 Nose by nose, line by line, tail by tail, you could plot the first hundred years of the company through five corrals and still be surprised and delighted by the unexpectedly left-field styling tricks that the company have invariably sprung from time to time. 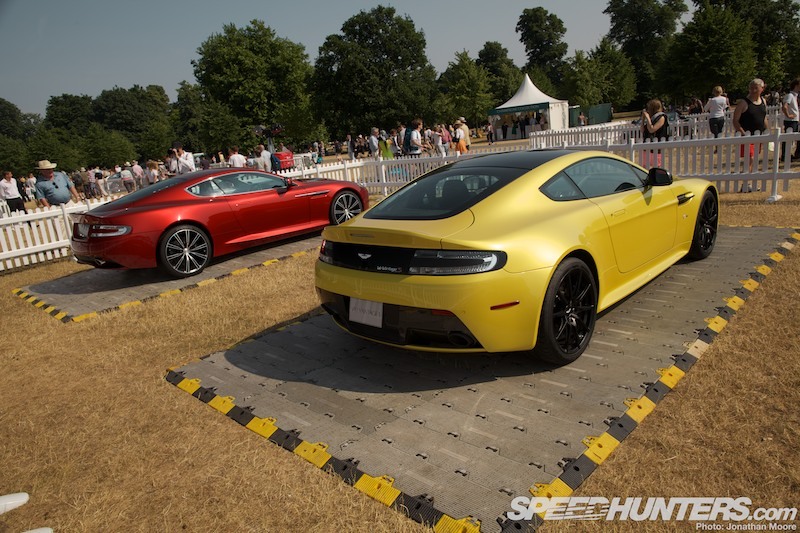 After all, who would have expected that evolutionary twist from the DB series to the DBS and V8? 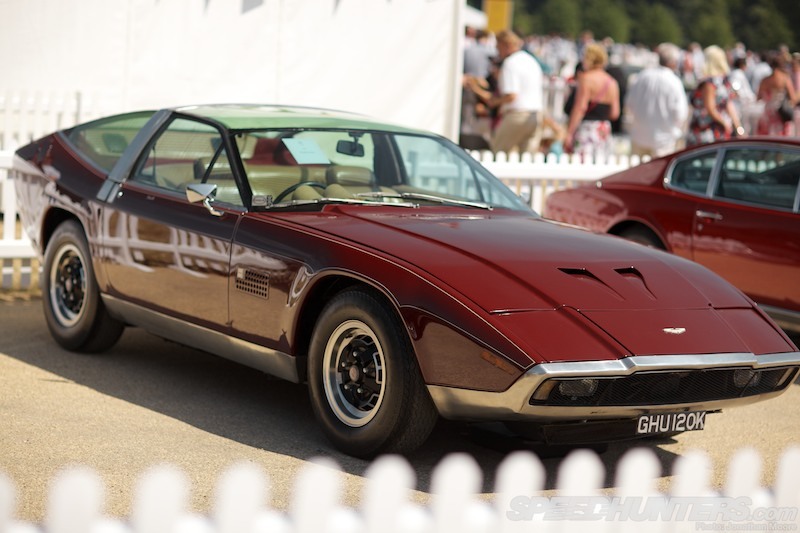 How about the DBS V8 Ogle – ‘Sotherby Special’ – that cost the equivalent of four Ferrari Daytonas. 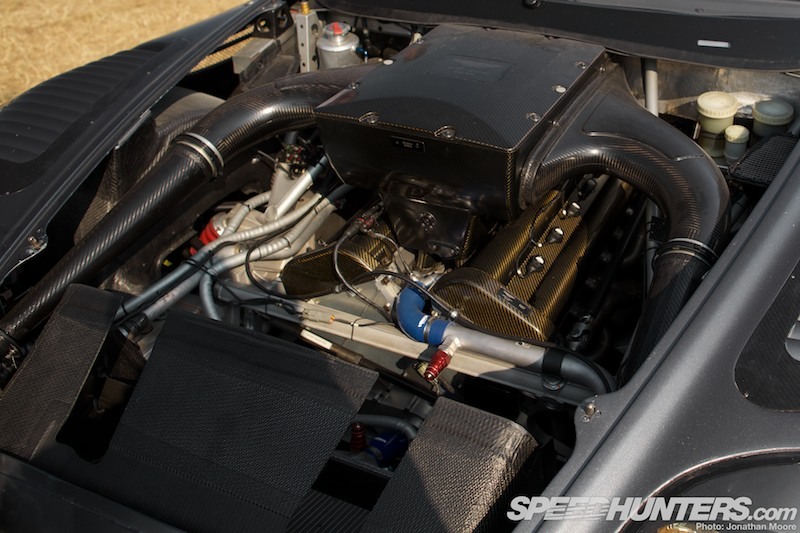 … or the 1980 700hp Bulldog supercar? 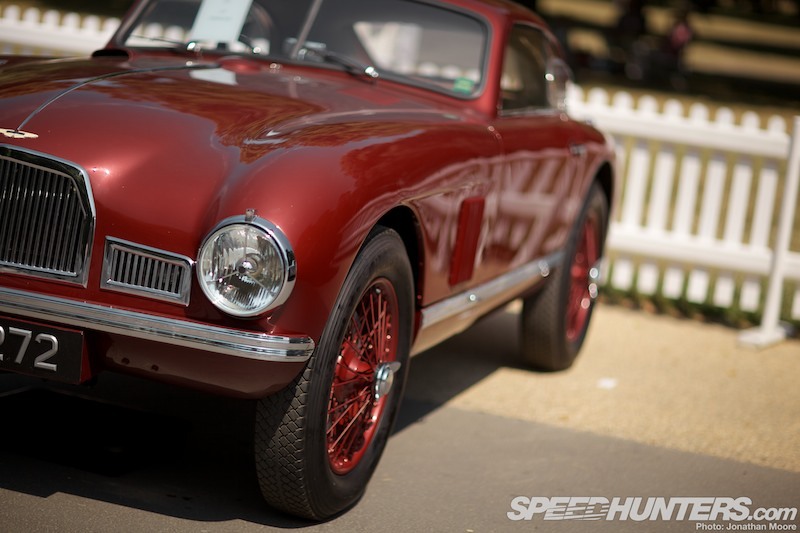 When would you ever expect to see these cars in person, let alone together?! 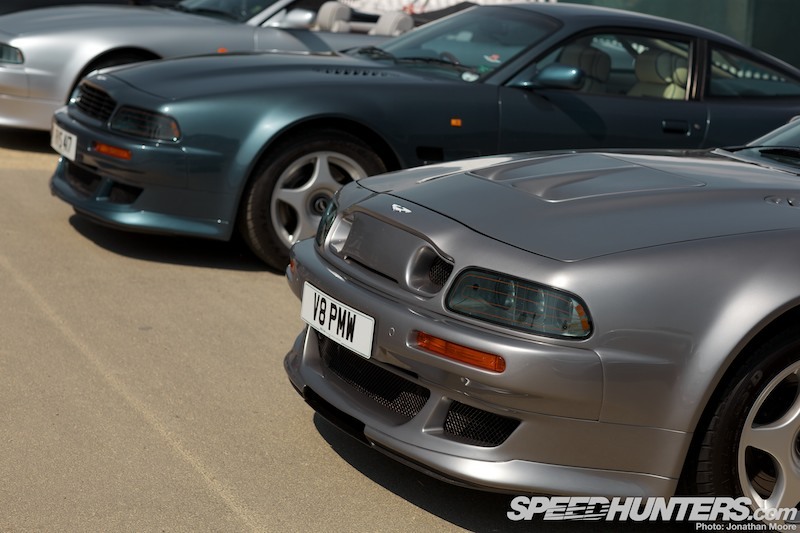 Then the excess of the 1990s and power-hungry muscle cars like the limited edition Vantage V600 and Le Mans… More Saleen than Saville Row. 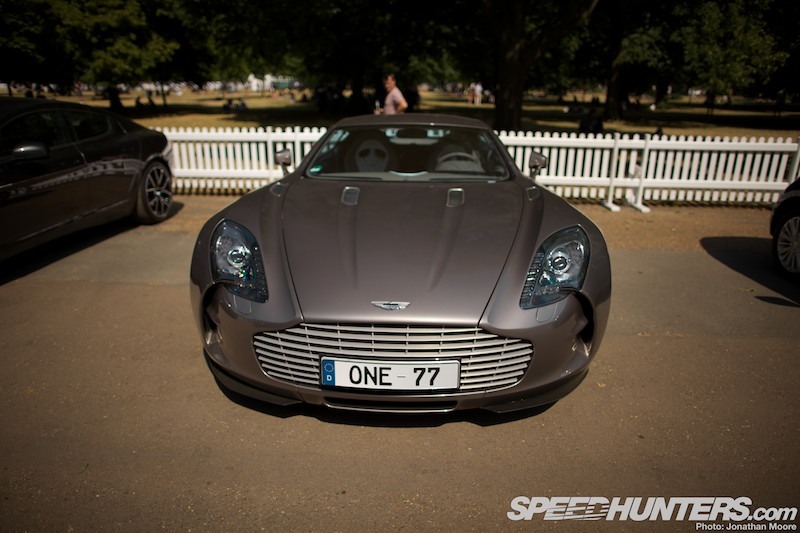 … the Vanquish Centenary Edition and finally the incredible CC100 Speedster Concept. Happily sitting out in the sun as if it wasn’t a big deal. Don’t forget that Aston Martin has one hundred years of motorsport history to match its road-going output though, and that fundamentally important side was celebrated with its own dedicated display area. 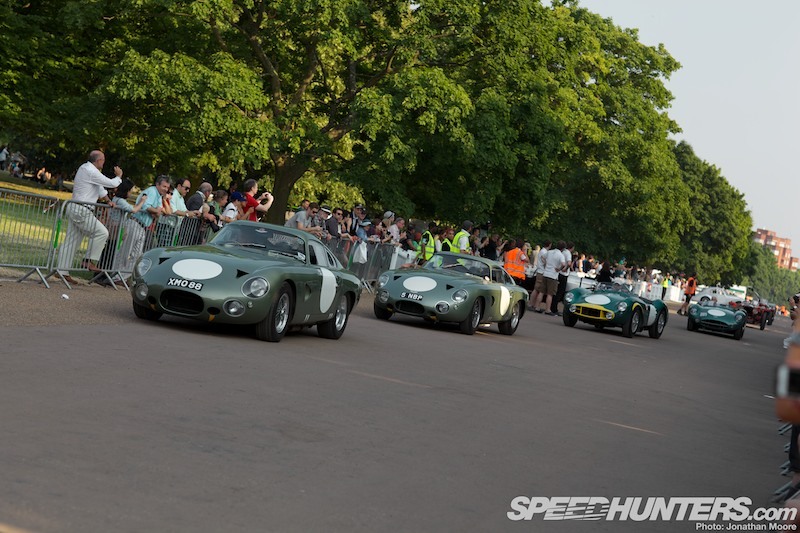 This was the only part of the event that was invite only (a collection of Bond cars was also on show, that we’ll cover in a future article), but it did allow even closer access to some priceless racers. 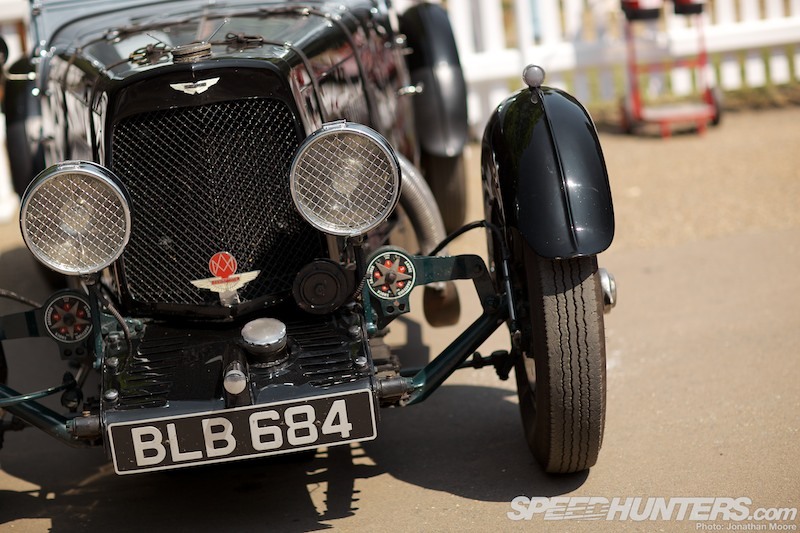 The Le Mans 24 Hours has always been at the heart of Aston Martin’s competition history, with their first run across to France made in 1928 before dipping in and out through the decades. 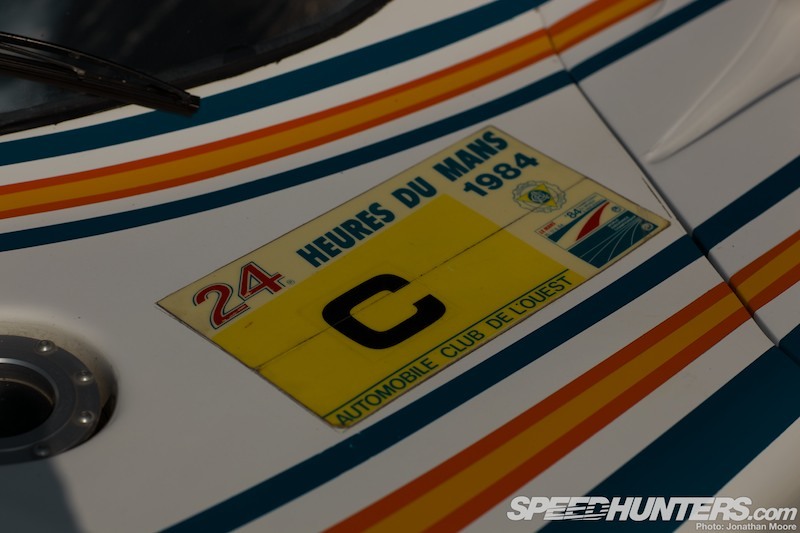 Class wins in the early ’50s led to outright victory in 1959; they returned during the Group C period of the ’80s and of course, more recently have had incredible success in the GT classes. 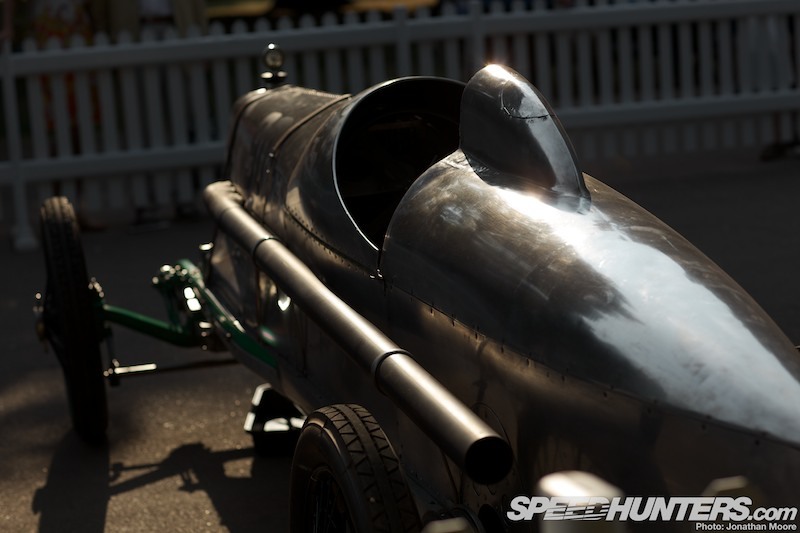 As with the hundred car timeline, here you could get a glimpse of what that racing heritage meant in metal form. 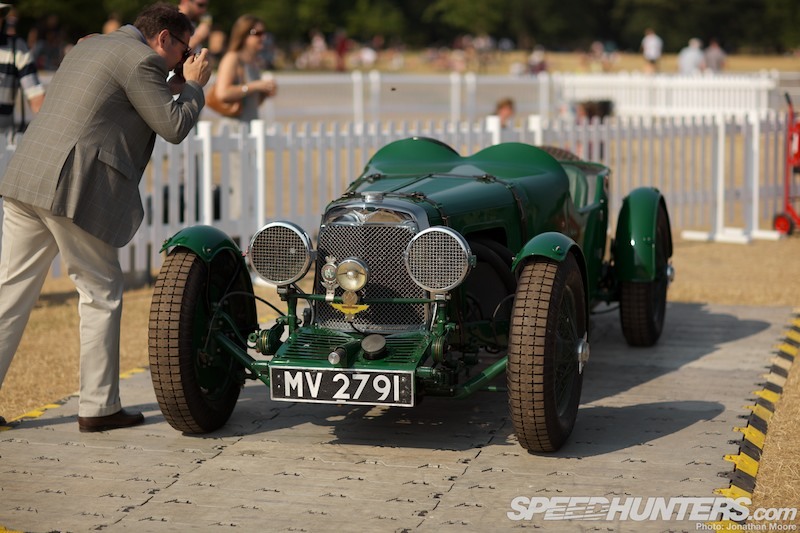 The LM8 was Aston Martin’s Le Mans pioneer: MV2791 was part of its 1928 team and is still attracting lenses 95 years on. 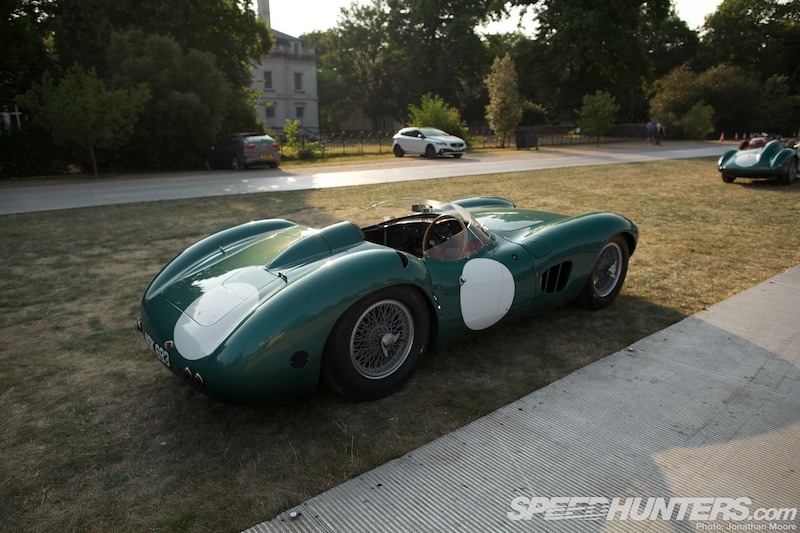 … but then the DBR1 is simply a sublime work of art. 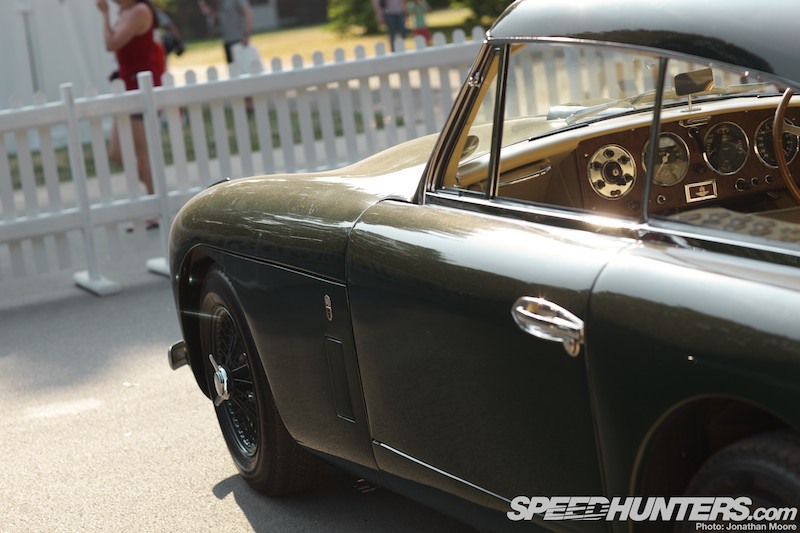 Every angle reveals more never-ending curves, and the car looks fast standing still. 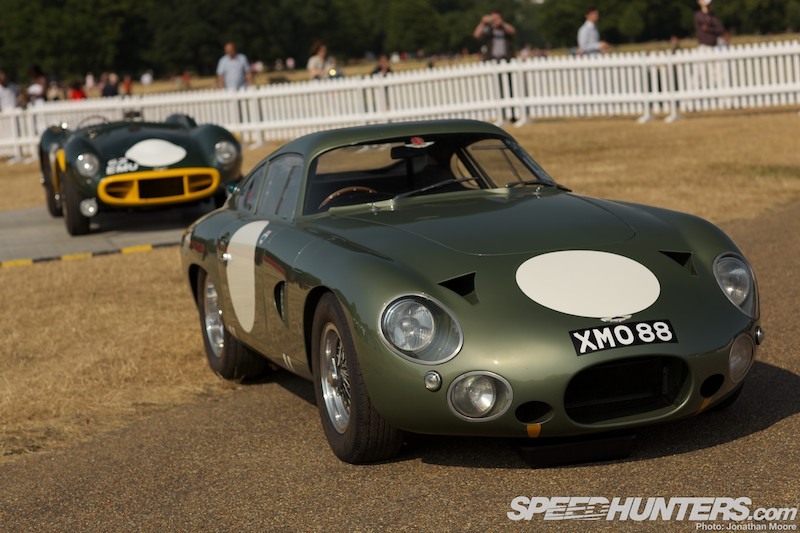 I’m feeling spoiled at the moment: at Brands Hatch I saw two of the Aston Martin DP Project Cars, one genuine and one reproduction, but at Kensington all three iterations were represented: DP212, 214 and 215. 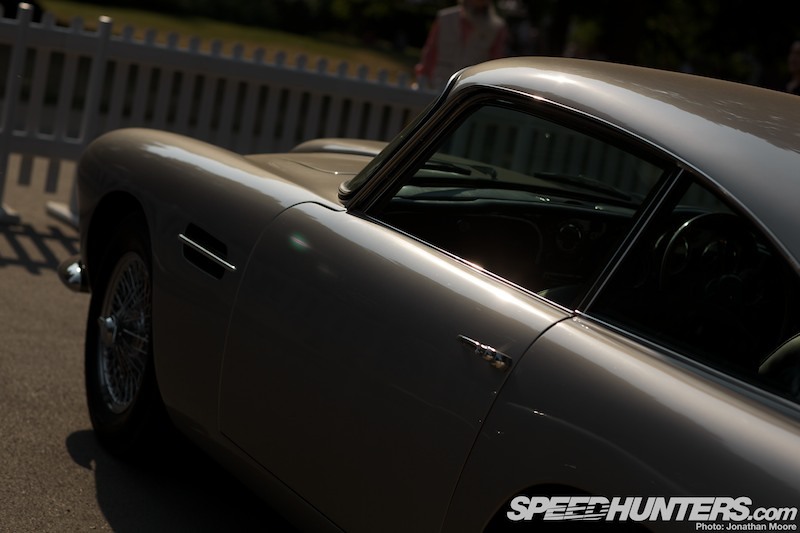 Likewise, Zagatos styling interpretations of the DB4. 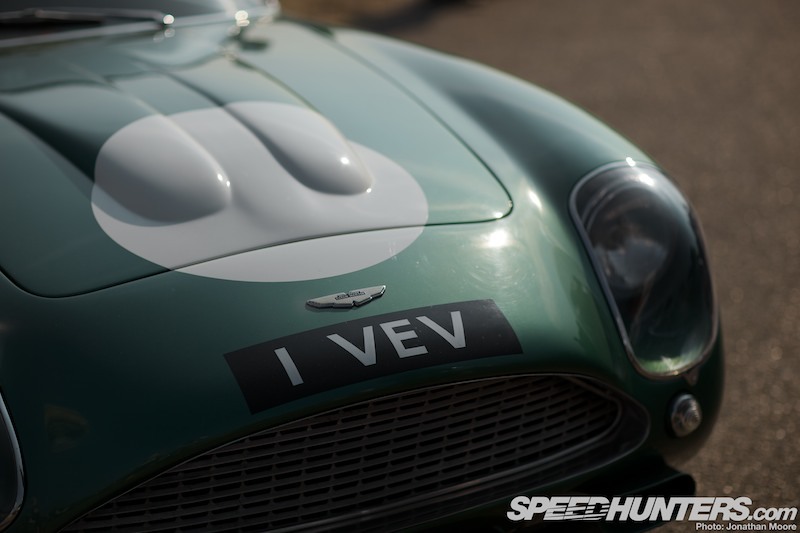 Two were in London: 1 VEV and 2 VEV, the Essex Racing Stable cars that raced at Le Mans in 1961. 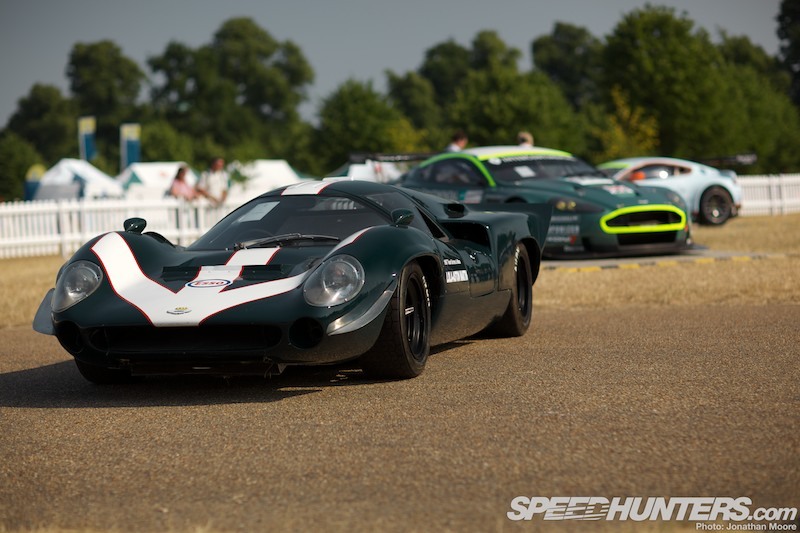 The beautiful Lola T70 used an Aston Martin-developed V8 for its inaugural tilt at Le Mans: the two entered cars might have looked stunning, but the engines in both died within the first couple of hours… Proving that Aston Martin are more willing than most to admit to their failures, this wasn’t the only car on show that didn’t live up to expectations. Following the Aston Martin Nimrod programme of the mid-’80s, the sledgehammer AMR1 was a serious effort to crack the Group C era of Le Mans – though it couldn’t match up to the big-budget squads from Jaguar and Mercedes. It’s definitely one of the best-looking Group C cars though. 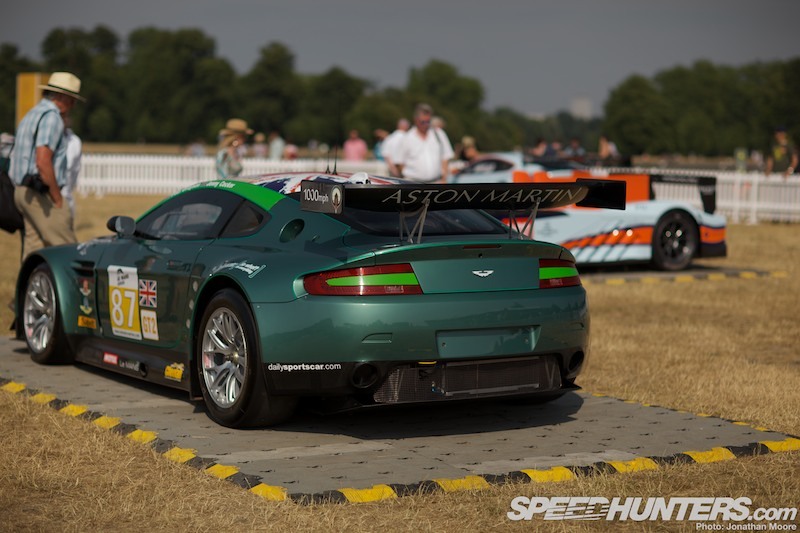 Aston Martin’s current GT odyssey was kickstarted in 2005 with the introduction of the DBR9 GT1 car: a fire-breathing monster, as all GT1s are supposed to be. 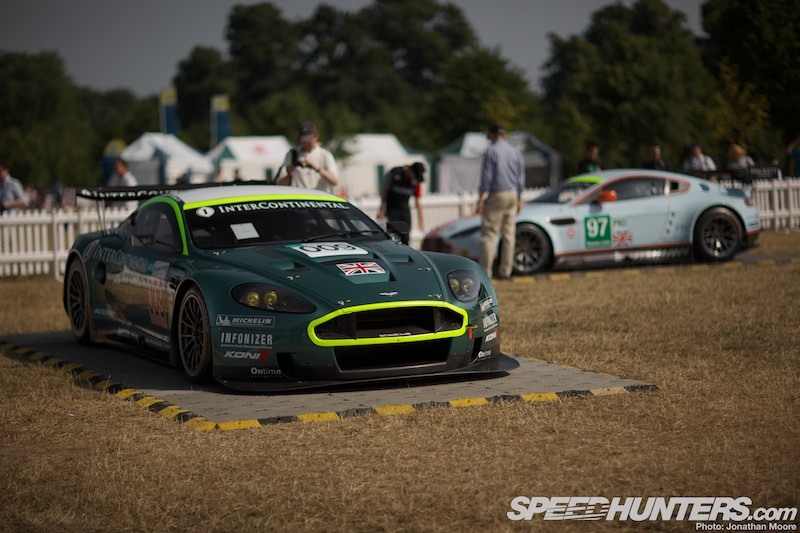 Developed by Prodrive after their successful 550 programme, the DBR9 has become one of the all-time great GT cars. The DBR9 GT1 raced at the top line for six years: I saw it race many times during the glory days of GT1 and never tired of its screaming V12, whether in works hands or with the many privateer teams who ran it, such as Team Modena’s stunning black chassis, DRB9/101. 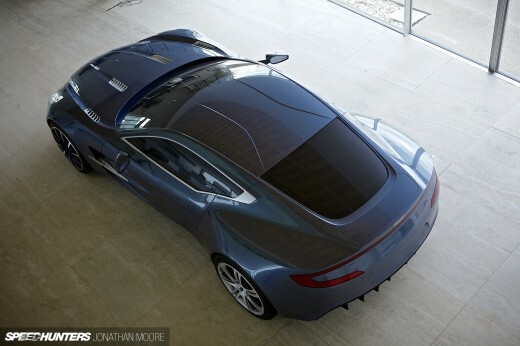 With the bonnet off, you could see just how far down and to the rear the carbon-and-kevlar-covered V12 was mounted. 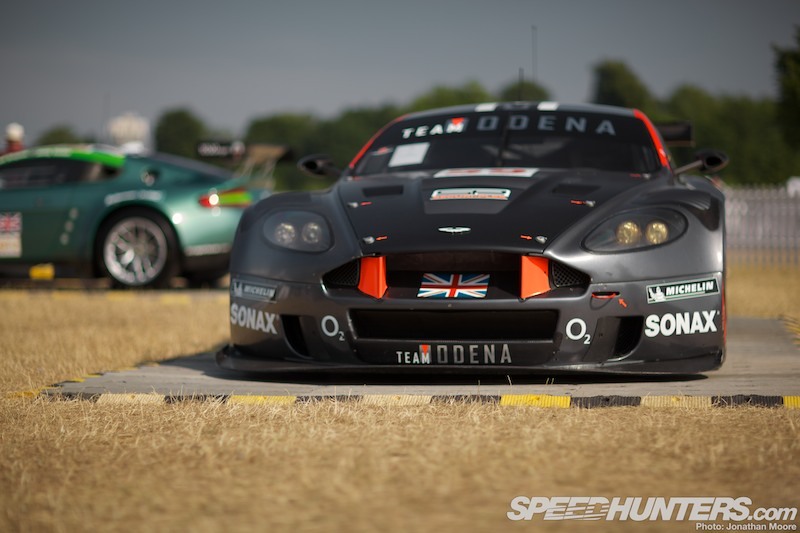 As GT1 was killed off, so the company continued to developed the DBRS9 for GT3 and the new Vantage for GT2. This was the snub-tailed Drayson Racing chassis, one of the first Vantages to be raced, and the forerunner of the current GTE cars. 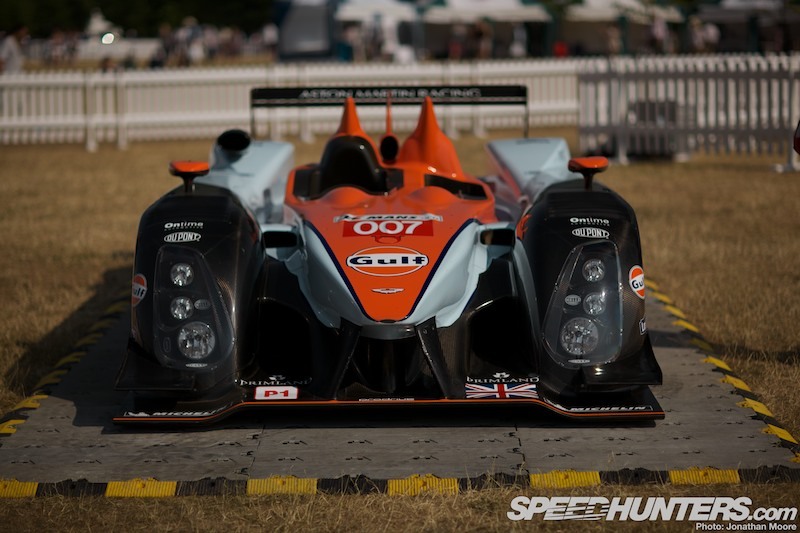 Although the failure of the Lola can be consigned to history, I was surprised to see an AMR-One – a car whose experience at Le Mans made the T70 experiment look like epic win. 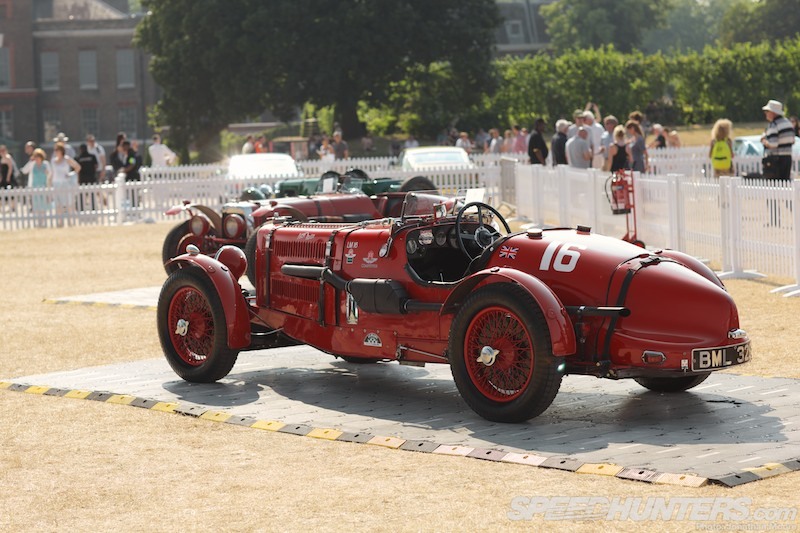 The chassis might have been good, but the bespoke straight six had a built-in self destruct that meant they rarely lasted more than a couple of laps. I thought all these chassis would have been compacted, or had been sold to other teams to be converted into other cars! 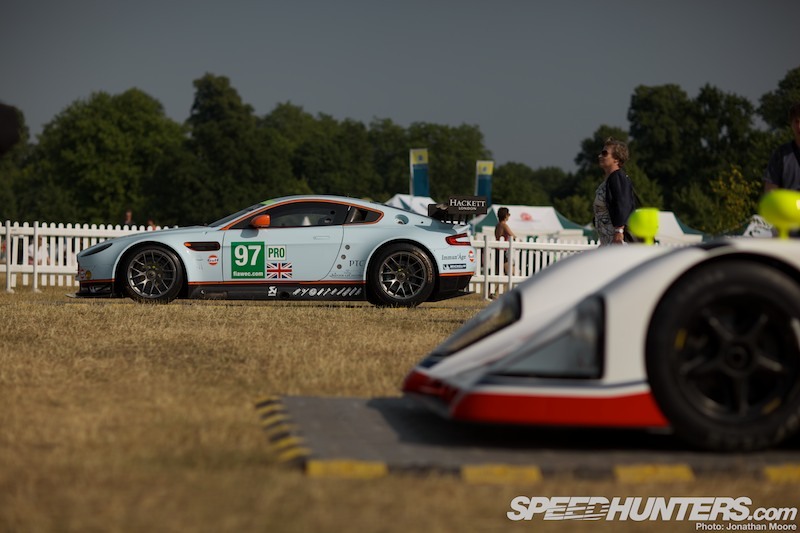 The final, newest car was of course a V8 Vantage GTE, chassis 001 that finished third at Le Mans this year after that particularly challenging race. You still have to hear this car to believe it: it’s like a prop-driven fighter plane! 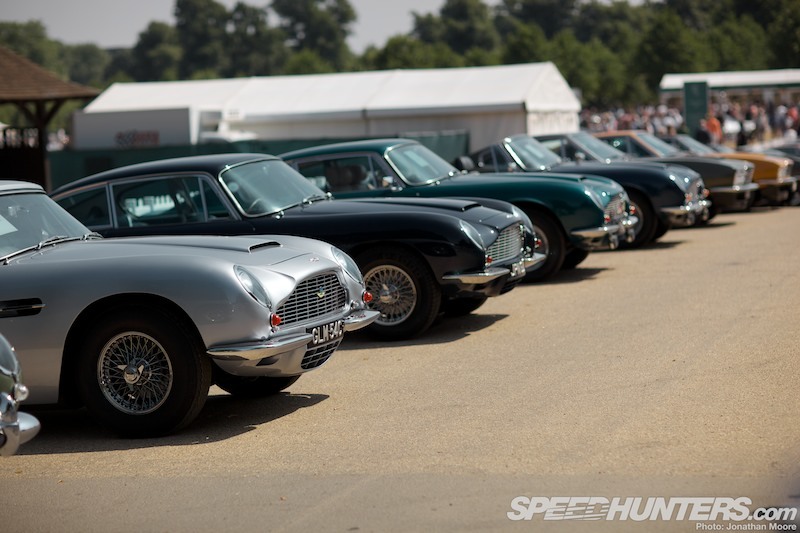 As the sun began to lazily sink over London and the light began to fade to a glorious yellow, I couldn’t help but stroll back up past the line of 100 cars, pausing as I went to take in yet more detail. 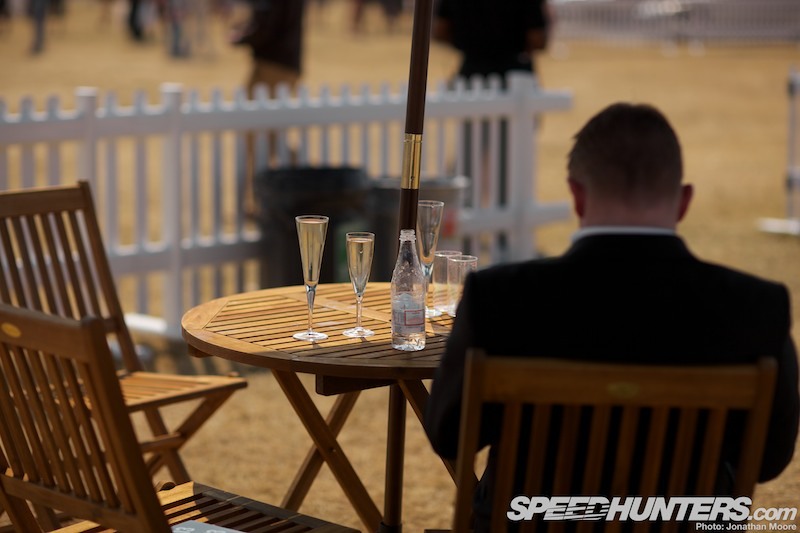 The final unexpected pleasure was seeing the upper two corrals of earlier Astons plus the racing paddock driving up the boardwalk to exit the gardens. 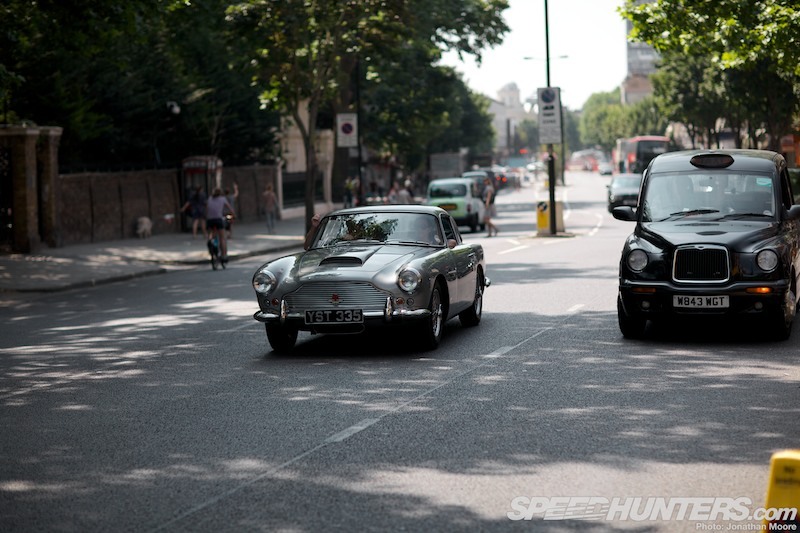 The majority of road cars were to exit onto London’s streets and meld into the traffic jams outside, the remainder to match up with their transporters for their own journey home. Spontaneous applause broke out as these dozens of cars drove past the delighted crowd: it was the perfect way to end the day. 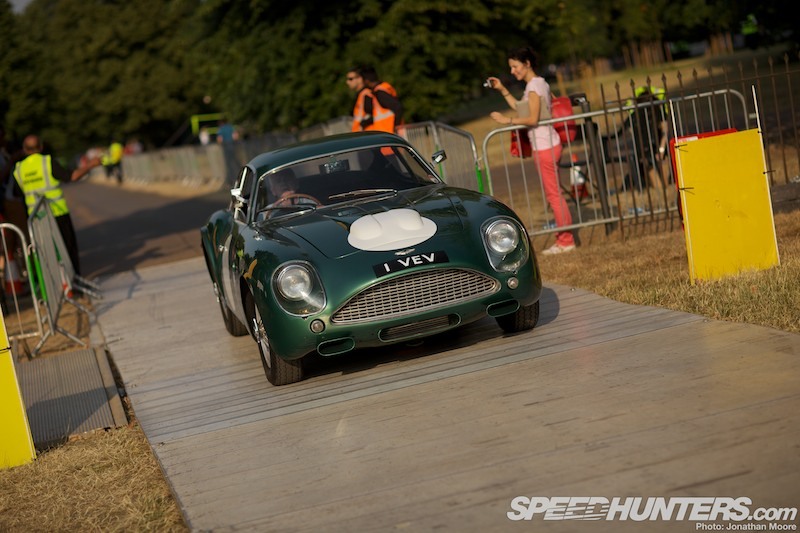 By no means does this London event mark the end of Aston Martin’s planned festivities for the year: still to come is the Silverstone Classic, two more road tours (one in Scotland and on the west coast of the USA) and the Pebble Beach concours. But the Centenary Celebraton in the Royal Park outside Kensington Palace was something particularly special. I imagine it’s going to be some time before I can next walk through a London park and hear the sound of racing engines bouncing off the trees around me!